The moment I got to know that I am nominated for the Fed Cup for the first time, I was sitting in my hotel room all by myself in the smallest village of Italy, lamenting, for I just had lost a match. This was when Babara Rittner, who is the Head of our Fed-Cup-Team, gave me a call on my room, to deliver the good news personally. I almost dropped the receiver, my blood ran cold and I started to feel queasy. The Fed Cup is the only tennis competition you do not compete in as single player but as a team. There are three world groups, which are organized pool-like. Almost every country of the world is positioned in one of the different groups. The first world group is the strongest and hosts famous tennis nations such as Russia, USA, Serbia as well as us. In 2009 Germany carried the victory against China in Frankfurt and thereby established a place among the eight top teams of the world. Being a part of the Fed Cup is the greatest gift to any tennis player, but at the same time the greatest emotional challenge. You suffer, you laugh, you enjoy, you cry. A thousand feelings compressed into one week are often very exhausting. But most notably Fed Cup makes up a wonderful time, whenever you get to share it with an awesome team like ours. During Fed Cup you play for others in the first instance. For the rear gunners, the team doctor and the physiotherapist who are up day and night just in case something happens to us, for fellow travellers and of cause for the home country wherewith I represent no less than 80 million people. Even though I play for Germany, I am still very connected to my birth country Serbia and feel local there. But unfortunately, you can’t compete for two nations. 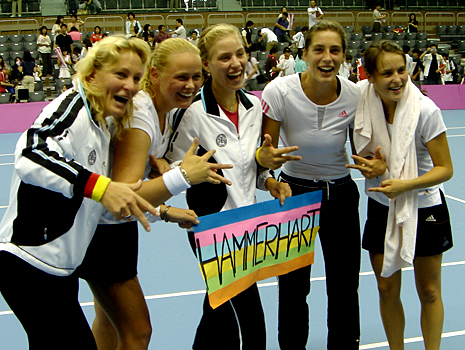 Sabine Lisicki, Anna-Lena Grönefeld, Tatjana Malek, Kristina Barrois, Julia Görges and me are not only team mates but friends, a rarity within tennis. Yet even more rare are common aims, you intend to achieve as a collective. But besides that, we want to build up a lasting team for the years to come, since our average age is just about 21 years.